CoP is a group of people who share an interest, a craft and/or a profession. It can be created specifically with the goal of gaining knowledge related to their field. CoP can exist online such as within discussion board and newsgroup. It can also exist in real life such as in a lunch room at work, in a filed setting, on a factory floor or elsewhere in the environment. 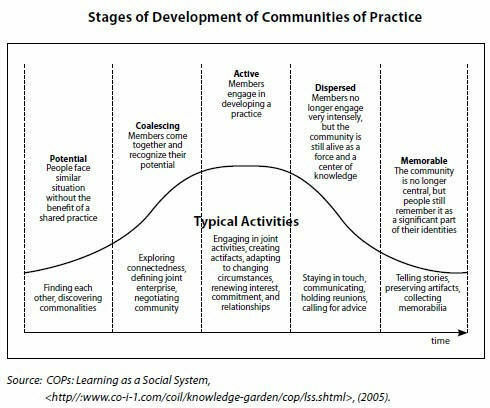 Communities of Practice (CoPs) are groups of people bound by a shared interest, purpose, or practice who often collaborate via established Web sites. These community Web spaces are designed to allow community members to share ideas and knowledge in several ways. 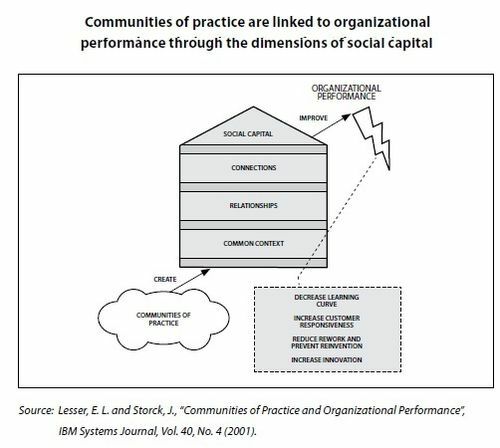 In the context of addressing organizational needs, CoPs are groups of people connected to each other by a need to solve business problems and sharpen skills by sharing common practices and experiences. CoPs form and share knowledge by pulling information from individual members, as opposed to a centralized push or information from higher authorities. In CoPs, the processes of learning and membership are inseparable. People organize around common needs and interests that give members a sense of joint enterprise. Example 1: To capitalize on the expertise of employees in developing new products in more productive ways, a leading semiconductor company established groups of engineers who share knowledge, tools, design methodologies, successes, and mistakes to develop their design engineering competence. Example 2: A research company brought researchers together to explore, share, and identify new solutions to satisfy customer needs. Users can access virtual library course links; policy directives, forms, FARs and supplements; common practices and sample formats; expert wisdom, advice, and guides; management support tools; "knowledge nuggets"; and can search over 180,000 documents from AFMC, DoD, and government web sites. 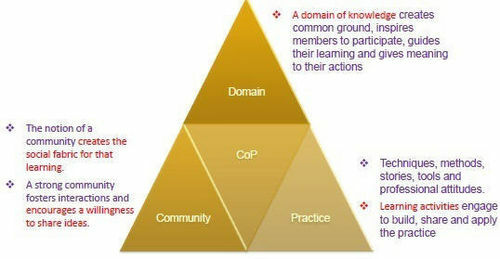 CoPs, as a knowledge management strategy, provide benefits to organizations as well as the individuals who participate. Supporting faster problem solving, both locally and organization-wide. Providing challenges and opportunities to contribute. 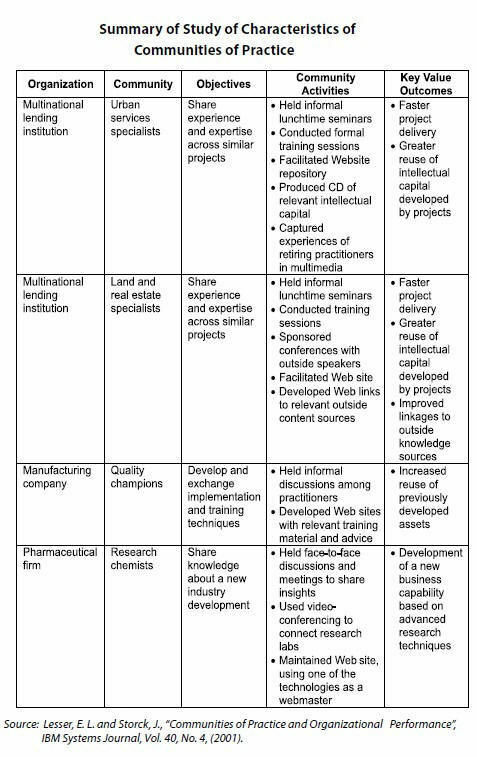 CD production of relevant intellectual capital. The Web as the primary vehicle for communication can be complemented by other forums (e.g., seminars, conferences). The following is the CoPs section of the Gov Online Learning Center. It is designed to allow Community Members to share ideas and knowledge in several ways. The following is the main Web site for accessing Federal CoPs examples. This site is sponsored by Federalconnections.org, which connects everyone who works with CoPs in government. The CoPs listed on this site are at various stages of maturity and represent various types of communities. This site, sponsored by the Federal Consulting Group (a franchise of the U.S. Department of Treasury), provides information about CoPs and refers to the groups as Communities of Learning.